Pre-game Ep1: "They Came At Us With Spears" Ep2: "Burly Girls, Bowheads, Young Studs & the Old Bunch"
Filming begins today, 18 players, men (Lopevi) vs. women (Yasur). 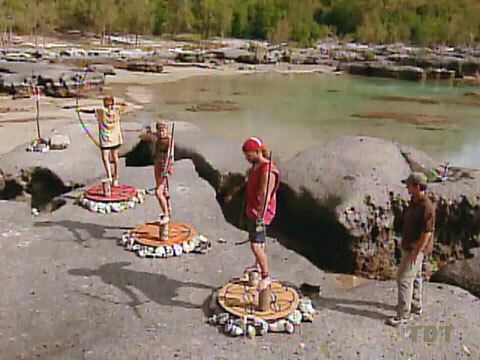 Every member of each tribe must complete each stage before advancing: mud crawl, table maze, balance beam, then fire starting. Yasur passes Lopevi (Chris) on the balance beam, and wins immunity and flint. Ep1 RC/IC: "Fire Starter" - Yasur wins. TC1 - Brook voted out (5-3-1), 17 left. Scout sits out. Contestants are numbered 1-8, and must pass each other (in order) on a balance beam without touching more than one contestant at a time. Yasur beats Lopevi easily. Yasur wins a hammock, blankets & pillows. Ep2 RC: "By the Numbers" - Yasur wins. Dolly sits out. Sarge and Scout serve as callers. 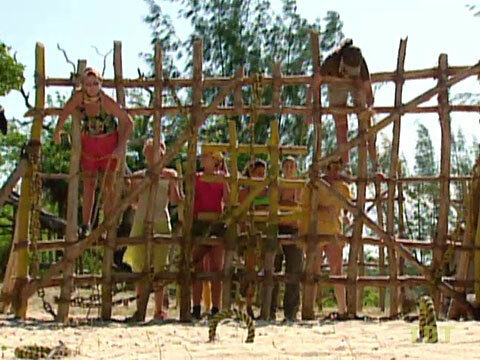 Tribes must send blindfolded and tethered pairs (or trios) of people to retrieve puzzle pieces, then use the pieces to assemble a multiple-tiered 'staircase' puzzle. Lopevi wins, finally gets flint. Ep2 IC: "Four on the Floor" - Lopevi wins, gets flint. TC2 - Dolly voted out (5-4), 16 left. 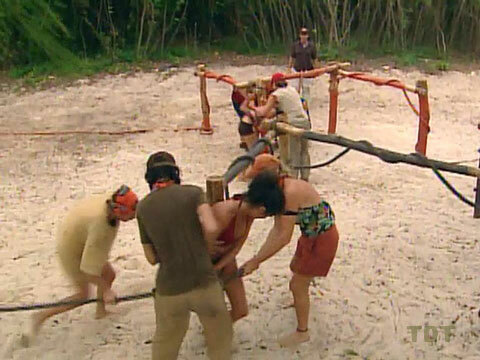 Ep3: "Double Tribal, Double Trouble" Ep4: "Now That's A Reward" Ep5: "Earthquakes and Shakeups" Ep6: "Hog Tied"
In first part of the challenge, tribes must get through a series of gates (as in the later Jailbreak challenge). Lopevi wins, gets fishing gear. 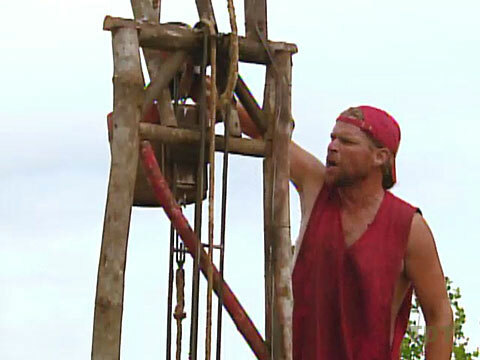 Lopevi then has an individual IC, digging up ladder rungs and making a ladder. 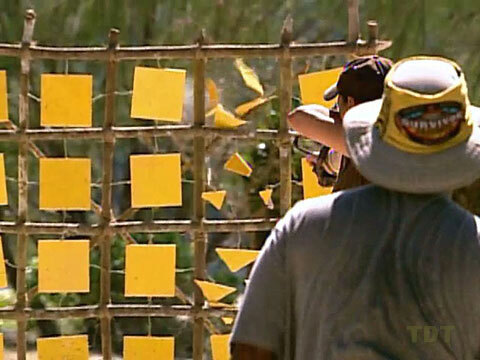 John K wins, then gives individual immunity to Ami at Tribal. Ep3 RC/ IC: "Great Escape Run" - Lopevi, John K. win. TC3 - J.P. voted out (5-3). TC4 - Mia voted out (5-3), 14 left. Yasur and Lopevi play Concentration. Matches: Ami 1, Eliza 1, Julie 1, John K 0 (blows it), Leann 1 (gets the one John K blew), Sarge 1, Twila 0 (misses coconut), Chad 1 (gets one Twila missed), Lisa 1. Yasur wins, 5-2, gets the instructive services of Dah, who spends the day showing them how to better set up their camp. Dah departs Yasur camp. Tears. Rory and Eliza are puzzle directiors. Yasur solves a simple 4x4 placement/logic puzzle. 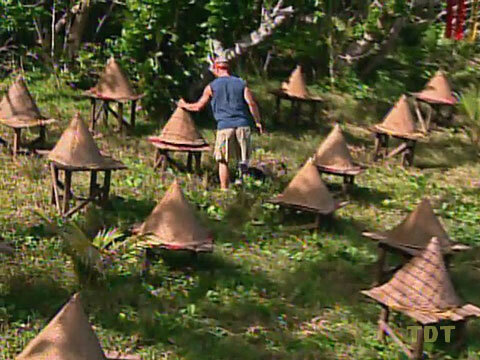 Ep4 IC: "Tribal Tiles" - Yasur wins. TC4 - Brady voted out (6-1), 13 left. Scout & Sarge pick new tribes. Bubba sits out for New Yasur. 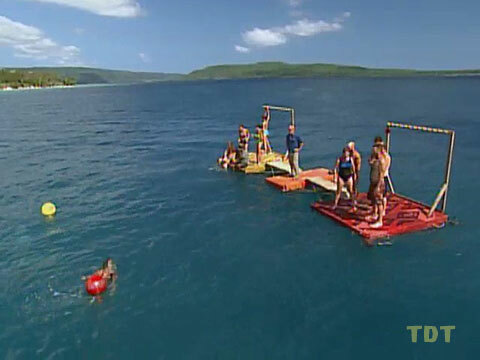 Contestants must dive for and retrieve markers at different depths along a rope attached to a buoy. Chris narrowly saves New Lopevi from his own screw-up, retrieving the 22-foot marker, beating Ami. Lopevi wins Pringles and beer at a waterfall. Ep5 RC: "Dive Masters" - Lopevi wins. Scout sits out for New Yasur. 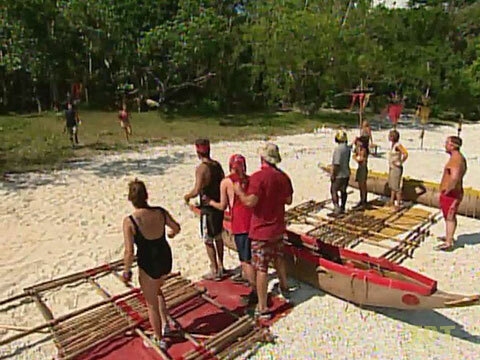 Lopevi wins at retrieving outrigger parts, assembling a canoe, and paddling to retrieve a flag. 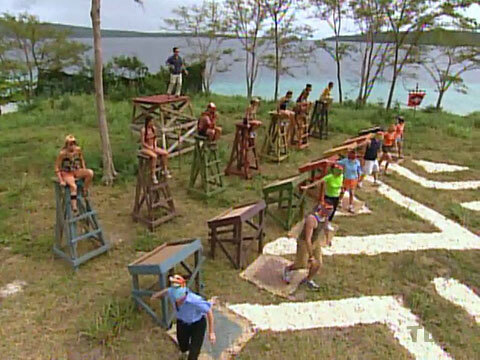 Ep5 IC: "Outwit, Outplay, Outrig" - Lopevi wins. TC5 - Bubba voted out (6-1), 12 left. Gate-keepers: Scout, Julie. Lopevi easily doubles Yasur's pig-catching output, 10-5, winning steak and eggs. Ep6 RC: "Pig Pen" - Lopevi wins, gets steak and eggs. Ep6: "Hog Tied" Ep7: "Anger, Threats, Tears... & Coffee" Ep8: "Now the Battle Really Begins"
Lopevi gets all four sets of puzzle pieces and finishes the puzzle in the time it takes Yasur to get three. Lopevi wins. Ep6 IC: "Strung Out" - Lopevi wins. TC7 - Lisa voted out (4-2), 11 left. Sarge sits out. New Yasur finally wins, skillfully navigating an obstacle course to fill a jar with coconut water. They win coffee and letters from home. Ep7 RC: "Jo Coconut" - Yasur wins. Chris sits out. Yasur beats Lopevi at a slingshot-based tile-smashing challenge. Rory essentially saves himself with his marksmanship. Ep7 IC: "Shoot Your Way Home" - Yasur wins. TC8 - John K. voted out (5-1), 10 left. Lopevi wins at passing sea-water along in a bucket brigade; gets milk, cookies and chocolate cake. Contestants must grab a flag, jump off a platform, swim to the beach, and place the flag in a holder, then repeat. First round is three flags, and done in two heats of five people, with the top two finishers advancing to the final round, which has five flags. Results: First heat: 1.Sarge, 2.Eliza (barely ahead of) 3. Chris; 4/5 Leann & Julie. Second heat: 1.Rory, 2.Ami, 3/4.Twila & Chad, distant 5.Scout. Finals: 1. Sarge wins, easily. 2/3 Rory/Ami, 4. Eliza. Ep8 IC: "Jumper" - Sarge wins. Ep8: "Now the Battle Really Begins" Ep9: "Gender Wars... It's Getting Ugly" Ep10: "Culture Shock and Violent Storms"
Alinta gets around to naming itself. TC9 - Rory voted out (6-4), 9 left. Trivia-based coconut chop challenge - answer a question correctly, and you get to burn one of another player's three skulls. Elimination order - Q2: 9.Sarge out (Hit by Scout, Leann, Ami),8.Chad out (Eliza, Julie, Twila). Q3: 7.Chris out (Eliza, Scout, Eliza). Q4: 6.Eliza out (Twila, Twila, Scout). Q5: 5.Julie out (Chad, Sarge, Twila). Q6: 4.Scout (Sarge, Julie, Leann), 3.Ami (Chris, Scout, Scout) out. Q8: 2.Twila (Ami, Leann, Leann) out, 1.Leann wins helicopter chicken wings picnic with champagne, takes Julie. Ep9 RC: "Head Hunter" - Leann wins. 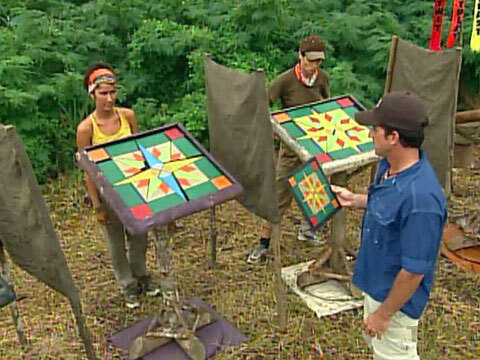 Probst briefly displays a mosaic puzzle, which the contestants have to re-create from memory. If they get it wrong, they're out. Order of elimination: First round - Chad, Sarge, Chris; 2nd round - Twila, Scout; 3rd round - Eliza; 4th round - Julie, Leann. Ami wins! Ep9 IC: "Memory Mosaic" - Ami wins. TC10 - Sarge voted out (7-1-1), 8 left. Chris, Chad and Ami guide Eliza along a twisted rope course, beating Julie and the rest. They win an overnight village visit (with Piggy and kava). 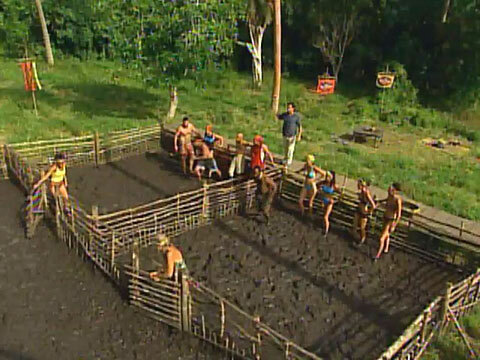 Ep10 RC: "Sacrificial Lamb" - Chris, Chad, Ami, Eliza win. Chris, Chad, Ami, Eliza return from Vanuatu village visit. 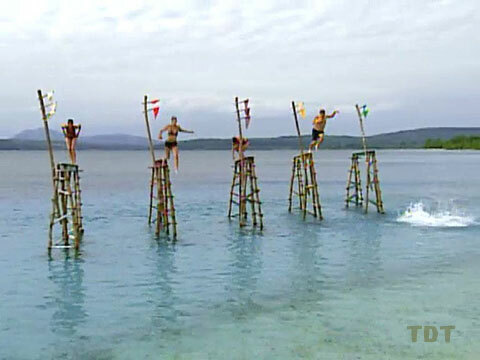 Contestants must hold themselves up on a pole as long as possible. Order of elimination: (No elapsed times shown, hard to judge how long people lasted) 8.Julie, 7.Chris, 6.Scout, 5.Ami, 4.Eliza, 3. Leann, 2.Chad, 1.Twila wins. 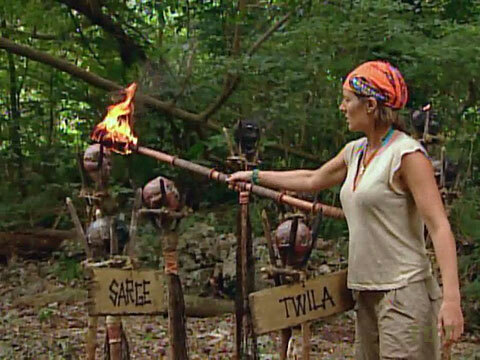 Ep10 IC: "Get A Grip" - Twila wins. TC11 - Chad voted out (6-2), 7 left. Ep11: "Surprise and... Surprise Again!" Ep12: "Now Who's In Charge Here?" Ep13: "Eruptions of Volcanic Magnitude"
Eliza best remembers trivia based on previous challenges. Order of elimination: 7,6. Chris, Twila (3 right), 5,4,3. Leann, Scout, Ami (6 right). Julie and Eliza face off in final tiebreaker, Julie gets 0 right, Eliza gets 1+, Eliza wins. She wins an overnight camp visit from her mom, Susan. Everyone else gets hugs. Ep11 RC: "Played Out" (loved ones visit) - Eliza wins. Eliza's mom, Susan, leaves Alinta camp. Survivors direct blindfolded loved ones to retrieve bags, then complete a puzzle together. Finishes: 7.Leann/Terri (stop mid-challenge), 6.Eliza/Susan, all others on puzzle as challenge ends. Chris/Lorie 2nd to start the puzzle, Scout/Annie 3rd, Julie/Justin 4th, Twila/James 5th. Ami/Crissy win. Ep11 IC: "Love Is Blind" - Ami and Crissy win. TC12 - Leann voted out (4-3), 6 left. 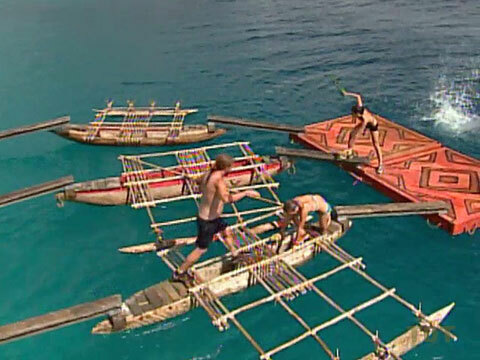 Survivors race over outriggers then dive to retrieve 3 flags. Eliza wins a Pontiac G6. Ami and Chris finish 2nd and 3rd to join her in an overnight resort getaway. Ep12 RC: "Bridge over Troubled Water" - Eliza, brings Ami and Chris. Eliza, Ami and Chris return from reward trip. Chris wins at glorified shuffleboard. 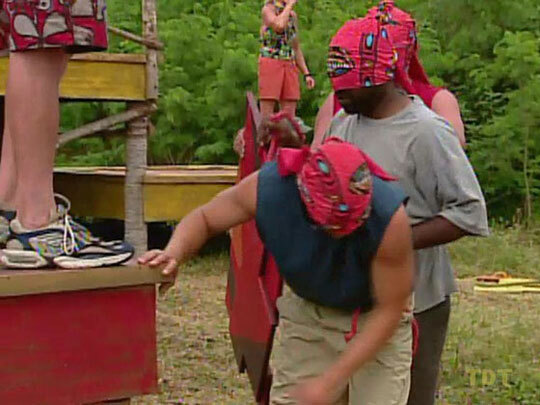 Ep12 IC: "Island Hopping" - Chris wins. TC13 - Amivoted out (4-2), 5 left. Four stages, single-elimination: 1. Mud crawl (Scout out); 2. Pig catch (Eliza out); 3. Puzzle (Chris out); 4. Balance beam/slingshots - Julie wins Mt. Yasur overnight horseback trip, takes Chris. Ep13 RC: "Redemption" - Julie wins, brings Chris. Chris and Julie return from Mt. Yasur trip. Eliza is the first to answer five memory questions based on a story Probst tells about an ancient Vanuatu warrior-chief. Ep13 IC: "Warrior" - Eliza wins. TC14 - Julie voted out (3-2), 4 left. 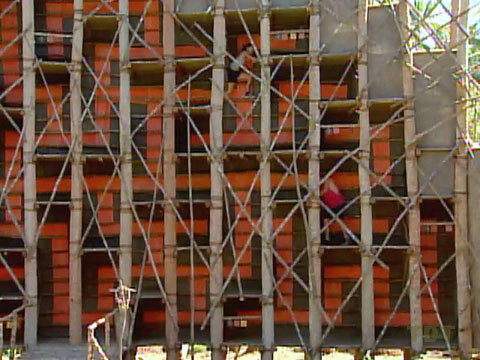 Contestants must retrieve 10 tiles pairs from within a massive vertical maze. When all tiles are collected, they must then decode a 10-letter, 2-owrd phrase (FINAL THREE). Chris narrowly beats Twila, Eliza is third, Scout last. Ep14 F4 IC: "Snakes and Ladders" - Chris wins. TC15 - Eliza voted out (3-1), 3 left. Chris outlasts Twila (and Scout, duh) at holding a drawn bow-and-arrow. Ep14 F3 IC: "Ready, Aim, Don't Fire" - Chris wins. TC16 - Scout voted out (1-0 [2-1]), 2 left. Chris delivers an impressive jury performance, and beats Twila, 5-2. Final tribal council and jury votes on Final Two. Chris wins, 5-2.